Forgive the Marie Hall kick, dear friends, but here’s another fantastic interview with her. As if Hall wasn’t spunky and amazing enough already, she says in this article that she wishes she could be a conductor! Even today, a hundred years later, it is relatively rare to see a woman taking on that job. This piece is by M. Dinorben Griffith; it appeared in the Strand Magazine in June 1903. “Marie is always, for ever and ever, plactising, plactising,” was the irate comment of two little boys when they failed to induce their but little older favourite sister to play with them. 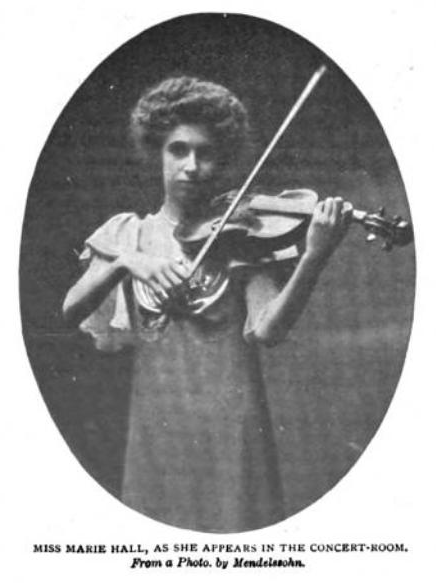 It is this “always, for ever and ever, plactising,” or, in other words, that infinite capacity for taking pains which is the sign-manual of genius, that has brought Miss Marie Hall, the girl violinist, to the front of her profession before she has reached her nineteenth birthday. Hers is no history of that forced and most miserable of spectacles – the child prodigy, often of ephemeral life and fame. A child prodigy she undoubtedly was, but of natural growth. Her talent was discovered and fostered by strangers, and it speaks well for her bodily and mental vitality that hard work, poverty, and even sorrow have only given strength to her personality and a finished maturity to her art. She loves her fiddle, and even when idly handling it a beautiful tenderness comes into her face, which is generally sad and grave almost to sternness. With her bow she shows her inner self to the world, at least to as much of the world as can understand its language; her clever fingers not only interpret the masterpieces of the great composers, but the longings and aspirations of a young life striving for the perfection which alone can satisfy it; and for fame, not for fame’s sake, but because it will enable her to carry out a noble, unselfish purpose. Like all highly-strung natures her personality is complex, oftenest grave, impulsive, yet sometimes as merry and gay as a little child. To interview her is as difficult as to follow a will-o’-the-wisp. The little lady, I noted, had more than one side to her character. Into the grave face as she spoke came a mutinous, mischievous look reminiscent of an enfant terrible. It was also easy to infer that her early childhood held no pleasant memories for her. She was one of a family of four sisters (two of whom died) and two quite young brothers, one of whom – Teddy – is the stimulus to hard work and the making and saving of money on her part. 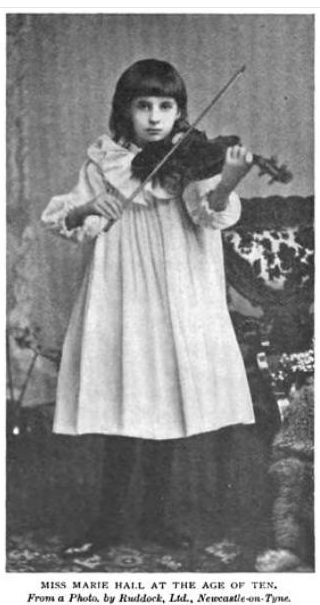 He shares his sister’s love of the fiddle, and, although not yet nine, according to Miss Hall is “much cleverer” than she. She started learning the harp when only five, and the violin at the age of eight and a half, her father being her first teacher. Those lessons were not shirked, they were her only pleasure. 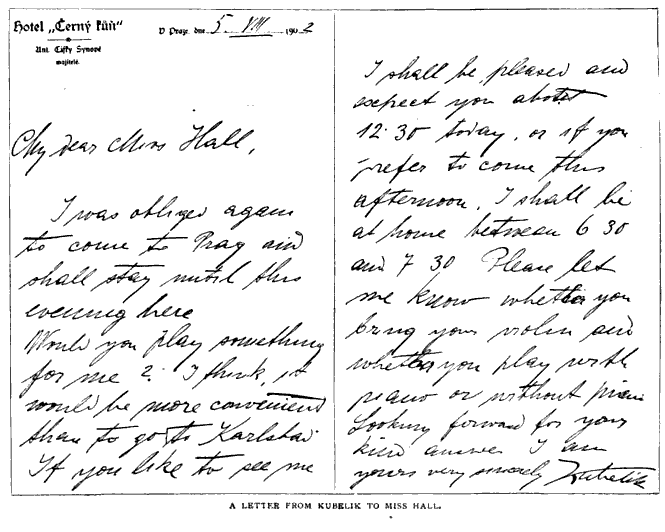 More may be learned of Miss Hall’s early days from what she leaves unsaid than what she says, but there is no doubt that when Mr. Hall left the opera company, that meant to him a regular weekly income of twelve pounds, and more especially on the termination of a short engagement at the Empire Theatre, Newcastle, the family were in dire straits. From the orchestra Mr. Hall had to come down to playing in the streets, his wife and children in turns assisting him in earning a precarious livelihood. The struggles of those days are written on Miss Hall’s face, but the fragile little figure is linked with an indomitable will. She is of the stuff that heroes are made of, withal a very girl, with a keen sense of humour and a pretty wit of her own. The day of her first violin lesson was an era in her baby life, for the little maid had planted her foot firmly on the first rung of the ladder of fame. She had no thought of what was to follow; she had gained her point, and it behoved her to prove that the violin was her special métier. “One day,” she said, “I played Raff’s ‘Cavatina’ to my father. I had been practising it hard as a surprise for him.” A surprise indeed it was, for it convinced him of her ability, and she was sent to Miss Hildegarde Werner, of Newcastle-on-Tyne, for lessons. She made remarkable progress, and her teacher was so proud of her precocious little pupil that she introduced her to M. Sauret, who predicted great things of her in the near future. Four hundred people were on that occasion – her second appearance in London – turned away from the doors. A guinea was cheerfully paid for standing room, and two guineas for a seat. One can easily picture that untidy ménage, with the little drudges turning out in the evenings to play for money when tired out with the hopeless task of keeping things straight at home. 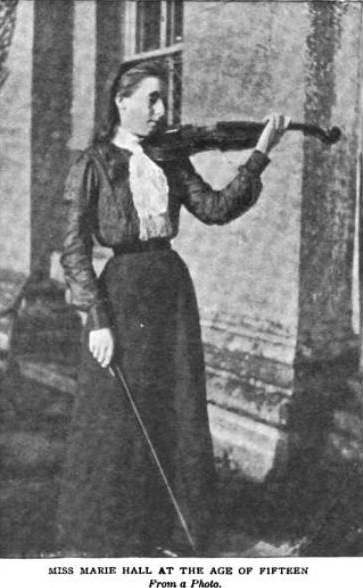 Herr Mossel was charmed with his pupil; he recommended her so highly to the Birmingham School of Music Committee that she received a free studentship, which she held for two sessions. “It was such a disappointment,” said Miss Hall, “and things were worse than ever at home. We moved to Clifton, and there met with friends who were most kind to us all. They were Mr. and Mrs. Roeckel, of musical fame. We got to know them through a strange incident. “As I told you, my uncle was a very clever harpist; he used to go about the country playing. Mr. and Mrs. Roeckel were spending a short holiday at Llandrindod Wells, in Wales. My uncle was there too, and they were delighted with his playing and spoke to him frequently, and learnt that his name was Hall. From this time their kindness was unceasing to the family, who owe much to their frequent and timely help. They took a practical interest in the clever girl violinist, and enlisted Canon Fellowes’s sympathy for their young protégée. By Mr. Roeckel’s advice Marie got up a subscription concert, Canon Fellowes promising to bring Mr. Napier Miles, the Squire of Kings Weston, near Bristol, to hear her play. The concert was a grand success, the playing of the delicate, frail, little fifteen-year-old débutante astonishing all present. “Wonderful! delightful!” said Mr. Napier Miles. He asked if she had ever played with an orchestra. “No,” was the reply. “Then you must come to Kings Weston for that purpose.” Her future tuition and expenses were practically assured from that day. It was while she was in London with Kruse that she first heard Kubelik. He had shortly before been playing Bristol, and Marie had urged her father to see him and beg of him to hear her play. “I saw,” said Miss Hall, “an announcement that he would give a recital in London on the 19th of June, 1900. I went. It was a red-letter day in my life. I went mad over his technique. As soon as the concert was over I went behind and waited outside his door, determined to see him if I had to wait until two o’ clock in the morning. After what seemed to me a long time he came out, followed by his accompanist. I rushed forward and said, ‘Oh, will you hear me play?’ He seemed very startled, drew back a little, and stammered, ‘I don’t know you, do I?’ Breathlessly I explained that my father had seen him at Bristol, and finally I left him with an appointment for ten o’ clock the next morning. I practised nearly all night, for to sleep was impossible. With the sublime audacity of youth she had elected to play one of the very pieces she had heard Kubelik play the previous evening, the “D Minor Concerto” of Wieniawski, which was the success of the evening. It is difficult to get Miss Hall to talk about herself. She acknowledges being a “creature of moods,” very full of spirits one moment, correspondingly despondent the next; gave, sympathetic, sedate, or a real little hoyden, full of fun and laughter. “Sorry to disappoint you – no, not one. She was the great Sevcik’s only English girl pupil, and he says, “She is the most gifted pupil I have ever had.” In addition to lessons at the Conservatoire, she had private lessons as well, working often fourteen hours a day and getting up at four in the morning. Miss Hall during her holidays once went to Marienbad, where Kubelik was also staying, and he gave her a few lessons. He has always taken a great interest in her and considers her playing marvellous. She had a grand reception at Vienna, where she gave a recital before returning to England, being recalled no fewer than five times after each piece, a great compliment from so critical an audience. “An Amati. 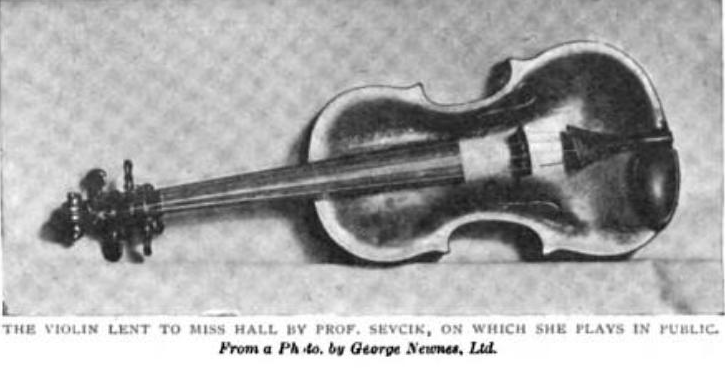 It was lent me by my master – Sevcik – and is the one used by Kubelik when he made his début. I have no violin of my own yet, but have three bows. I think I must learn to play on them. 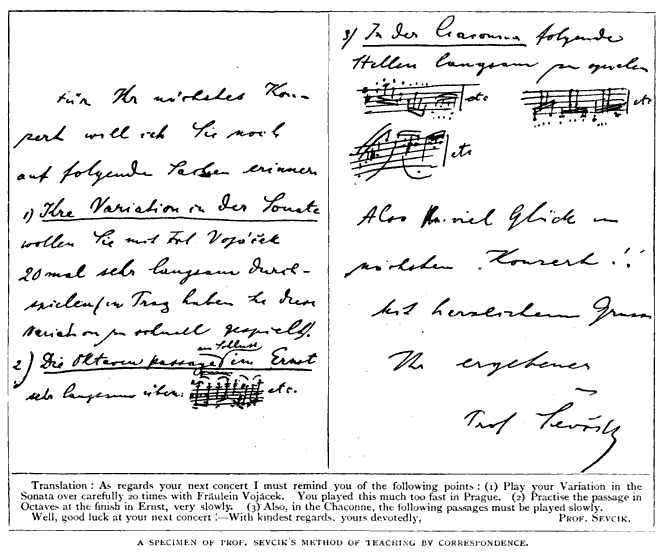 I was shown a letter from Sevcik; curious – as it showed his manner of giving his pupil violin lessons by post. In March last Miss Hall was made a ward in Chancery, which, on account of family differences, her friends considered a wise measure. Miss Hall has very artistic tastes, is fond of pictures, and has the usual feminine love of pretty clothes. She always designs her own gowns. In a literary way her favourite books are the biographies of great musicians. “I forgot to tell you one thing that is important,” said Miss Marie, with a laugh. “I am immoderately fond of oranges, and eat I do not know how many a day; they taste better if I am reading a novel at the same time; that is what I was doing when you came in,” pointed to “Temporal Power” and a plate of orange peel lying side by side. 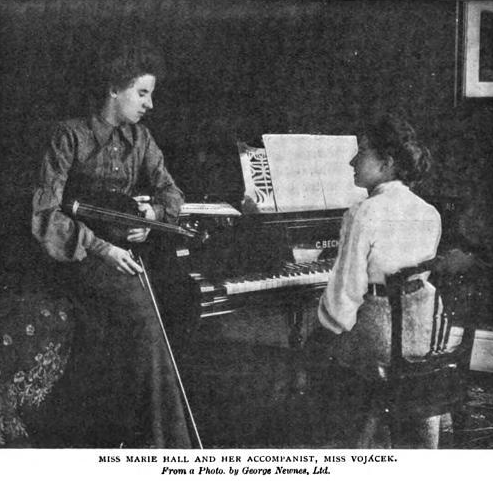 Miss Hall is fortunate in having as an accompanist a charming Bohemian lady, who was introduced to her by Sevcik himself. Miss Vojácek has travelled with, and accompanied, all the Sevcik girl pupils in England and on the Continent. There seems – if she does not overtax her delicate frame – to be no limit to the possibilities that the near future holds for this youthful and gifted violinist. Her short public life has been, and continues to be, a series of triumphs that might spoil a less modest and natural person. Extremely interesting! Look at her strange bow hold! I wonder what sort of sound she had? I’m so glad that the article proved to be of some use to you! Your family history is fascinating. Annette, would you mind dropping me an email on the address below. I’m part of a volunteer group doing research on Kings Weston House in the UK and I’d like to find out more about Marie Hall and her visits to the house. Here’s our facebook page so you can see who we are. The bendigo Historical Society (Aust) has a musical program featuruing a Marie Hall at the Royal Princess Theatre in Bendigo June 1907. Would this be the above mentioned Marie Hall? I don’t know Hall’s schedule for that particular month and year but it’s certainly possible. She was certainly the most famous performer of that name in the English-speaking world, and she played all around the globe. If I find out her 1907 schedule I’ll get back to you. 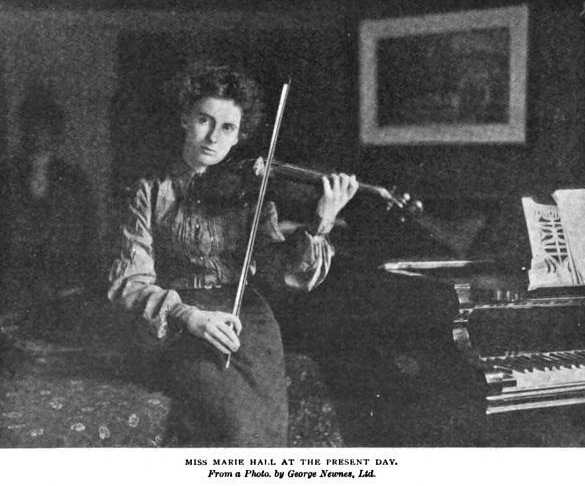 Thank you for posting the excellent articles about Marie Hall – I have been researching her for some years (she was a relative of my Grandmother) -her parents & grandparents originally came from Leamington Spa ,Warwickshire. I have much information about her career – concert venues & dates ,recordings etc which I would be happy to share. She was a close friend of Vaughan-Williams & introduced him to the poem that inspired The Lark Ascending- as well as given first performances of both piano & orchestral versions she also gave the first performance of the revised version in Bristol in 1926 with Vaughan-Williams conducting- I have yet to find out if she ever recorded it -however she did record nearly 50 pieces between 1904 & 1924(I have details of most of these)- several are available on Amazon UK MP3 downloads -Kreisler la precieuse,Beethoven minuet & Tor Aulin humoreske. No way!!! What a fantastic comment, this made my day. I have some projects going at the minute, but I will be in touch with you. I had no idea she introduced the Meredith poem to Vaughan Williams. Just got goosebumps. Thanks so much for contacting me. Malvern Civic Society is about to unveil a blue plaque in commemoration of Marie Hall in great Malvern. This will mention her playing on the streets of Malvern in her childhood. Hopefully plaque will be installed during Malvern Civic Week in July 2015. This is fabulous news!! Thanks for letting me know!